From Kitty Kono’s blog Back in the U.S.A. Used with permission. I of course covered all this in my Weddell’s Long-Necked Seal article, but now, I’ll take things further by determining just how long seal necks are. The tails and sacral vertebrae varied much more than what I expected (plus one source often lumped the two), so rather than measure necks relative to the length of the entire spine, I did so relative to only the thoracic and lumbar vertebrae (T–L from here on). And yes, there is going to be an appendix to this blog post. 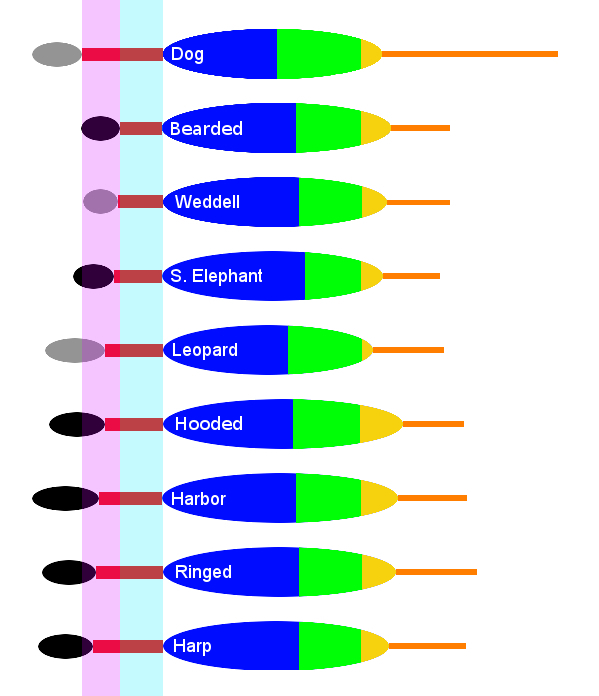 Black = Skull (gray for no data); Red = Cervical, light blue background equal to shortest neck, pink equal to longest neck; Blue = Thoracic; Green = Lumbar; Yellow = Sacral; Orange = Caudal. Species are (top to bottom): Dog, Bearded Seal (Erignathus), Weddell Seal (Leptonychotes), Southern Elephant Seal (Mirounga leonina), Leopard Seal (Hydrurga), Hooded Seal (Cystophora), Harbor Seal (Phoca vitulina), Ringed Seal (Pusa hispida), Harp Seal (Pagophilus). Phocid necks range from 21% T–L in Bearded Seals to 35% T–L in Harp Seals*, which falls short of dogs with necks 40.5% of their T–L. Weddell seals were initially described as “long-necked”, so it’s amazing to see they’re at the low end of the spectrum with necks only 23% T–L. Contemporary sources almost always describe Leopard Seals as “long necked”, however their necks are only 29% T–L, so perhaps “thin-necked” would be a more apt description. The extinct seal Acrophoca is also typically described as “long-necked”, although judging from this skeletal illustration and mounted specimen, the neck is around 30% T–L. The closest true seals have to long necks come from members of the “tribe” Phocini (Phoca, Pusa, Pagophilus), although I have no idea why that would be the case. * Piérard (1971) cites a source giving 35% for Harbor Seal T–L, so my figure above is probably a shorter-necked young individual. 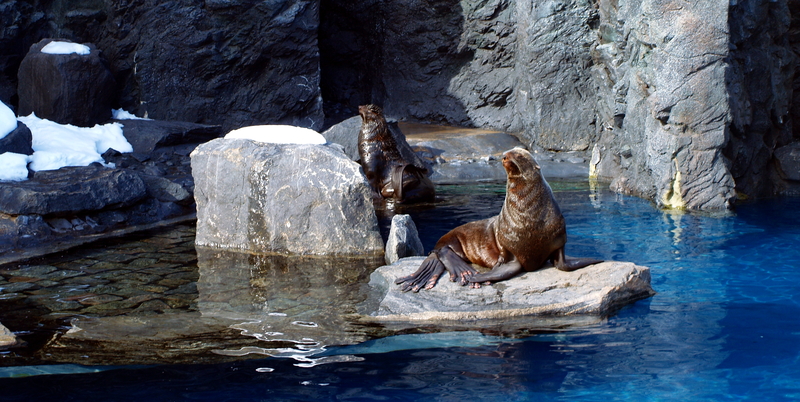 Northern Fur Seals (Callorhinus ursinus) at Mystic Aquarium. Same deal as before, but now with: Walrus (Odobenus rosmarus), Australian Sealion (Neophoca cinerea), Australian Fur Seal (Arctocephalus pusillus doriferus), California Sealion (Zalophus californianus), Steller’s Sealion (Eumetopias jubatus), Northern Fur Seal (Callorhinus ursinus). Otariid necks vary little, from 34.5% T–L in Australian Sealions (and most other being only slightly higher) to 41% T–L in Northern Fur Seals. 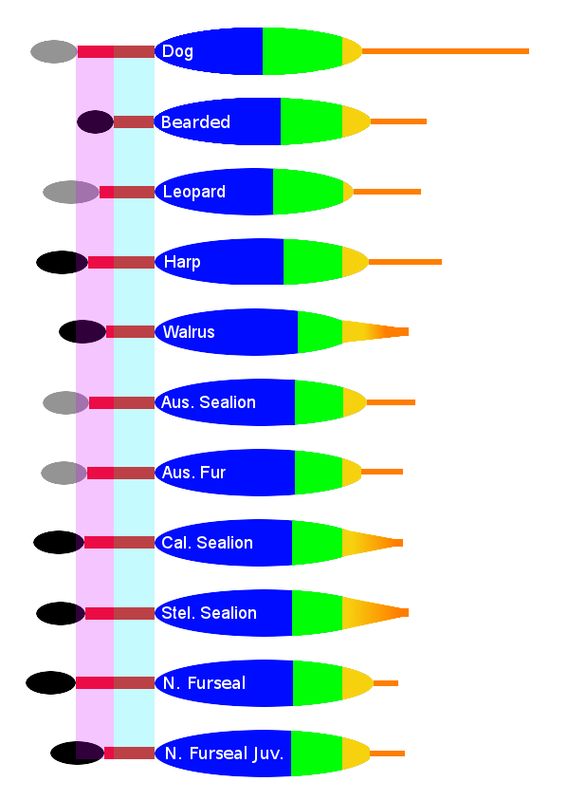 So there is certainly quite a pronounced difference in neck length between Bearded Seals and Northern Fur Seals, it does not seem that the average phocid, otariid or walrus is not truly that different in neck length. It should be cautioned that proportional neck length can change considerably during maturity, so there is certainly some error in these figures. The Bearded Seal was reportedly an old female (Hayden 1880) so if anything, it may have had a longer neck than average. One thing I haven’t mentioned so far is that pinnipeds have far longer tails than most observers would expect, ranging from 13.5% T–L in Northern Fur Seals to 41% T–L in Ringed Seals. I really have no idea why this would be the case. Allen, J. (1880) History of North American Pinnipeds. Available. King, J. (1983) Seals of the World. Piérard, J. (1971) Osteology and Myology of the Weddell Seal Leptonychotes weddelli (Lesson, 1826). Available. IN: Burt, W. (editor) Antarctic Pinnipedia. Riedman, M. (1990) The Pinnipeds: Seals, Sea Lions, and Walruses. Rommel, S. & Reynolds, J. (2002) Skeletal Anatomy IN: Perrin, W. et al. (eds.) Encyclopedia of Marine Mammals. Relevant Passage. Skull Cerv. Thor. Lumb. Sac. Caud. Data from King (1983) were in percentage of the entire spine with no data on skull length. Some Data from Hayden (1880) is in millimeters, and for instances where sacral and caudal vertebrae were lumped, I signified this with “?” in the area for sacral measurement. This entry was posted in Carnivorans, Mammals, Museum of Comparative Zoology, Original Research, Roger Williams Park Zoo, Soft Tissue and tagged Carnivorans, Harvard, Marine Mammals, Pinnipeds on March 15, 2013 by Cameron. Two remarks on seal necks. (1)Cetaceans– at least such “modern” types as Dorudontids and up– share with Phocids the locomtory style of propulsion by hind-body oscillation, so are under the same sort of hydrodynamic constrains, so have convergently “adopted” a typically short-necked form. Difference: they have REALLY short– short in skeletal structure– necks. Evidently they have never “felt the need” for “slingshot potential” for prey acquisition! Question: there are a few Cetaceans that have mobile and visibly long necks: Beluga, and some of the freshwater dolphins. What do their cervical vertebrae look like? I would assume they aren’t as short and as totally fused as those of other Cetaceans, but I don’t remember ever looking at and noticing the necks regions of skeletons of these species. (2) I was describing your post to my wife, and she suggested another possible function for an extensible neck: suddenly extending it, and bending to one side, while swimming at high speed might help initiate a turn. (No I don’t know enough hydrodynamics to even begin to think about guessing how effective this would be.) So maybe in addition to being prey acquisition devices (analogous, maybe, to the “great appendages” of some Cambrian arthropods?) they are also deployable as front-end (like “canard” stabilizers in aircraft?) rudders. Yikes, sorry about the moderation, hopefully I’ve fixed that problem! The oldest Lord Geekington did go down for a while when my domain name expired, but it seems to be up and running again. I should probably port over some of those classics just to be sure. I wonder if the lack of “slingshot potential” in cetaceans has to do with early members of the group having ludicrously large heads. Oddly, Kutchicetus has a neck that seems moderate in length, so maybe not. Next time I watch seals, I’ll have to keep an eye on their necks! Sealions at least certainly seem to swing around their necks a lot when swimming. Thanks for reply. It has been a while since I looked at whale skeletons, so I’m not sure anymore what rorqual cervicals look like– SOME big whale I looked at had cervicals that may not have been fused, but were very thin disks, so the whole stack of cervicals was only a few inches long… which would surely prevent neck flexibility! About early cetaceans having big heads (and in many cases long snouts): yes. I though of that as an alternative to “slingshot” for prey acquisition. Perhaps there is also a scale factor: many cetaceans have been very big animals, and the mass of their heads would perhaps make slingshotting impractical.